EASY-FIT Fluoride Reduction Filter System There is an increasing awareness of the d..
FT-Line VE Water Filter System The FT-Line VE model is a high quality inline water filt..
Coldstream have set out to make the very highest standard drinking water filters, capable of providing you with clean, safe drinking water that tastes great straight from the tap, or direct from a gravity fed supply anywhere in the world.... and they've succeeded admirably. 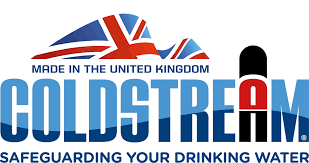 This has been achieved by means of Coldstream’s unsurpassed technical understanding of water filtration techniques and material performance, their comprehensive system and filter testing and manufacturing quality assurance and using unique high performance ceramics made using their own hi tech manufacturing processes at their renewable energy powered and efficient manufacturing facility in King’s Lynn in the UK. Their team of technical experts are some of the most experienced in their field, creating and delivering solutions in countries all around the world. 1) Rubber - The Coldstream system has 4 filters which eliminates the need for the rubber grommet which has been the cause of both complaint (because of the rubbery taste) and failure (because of the grommets having defects which allow unfiltered water too pass through - which is a massive issue especially when considering usage on raw untreated water supplies). Therefore, for this reason, Coldstream and better and more reliable and having four filters massively improves the flow rate, making production much faster. Of course you can add up to 4 filters in competing products but these do not come as standard. 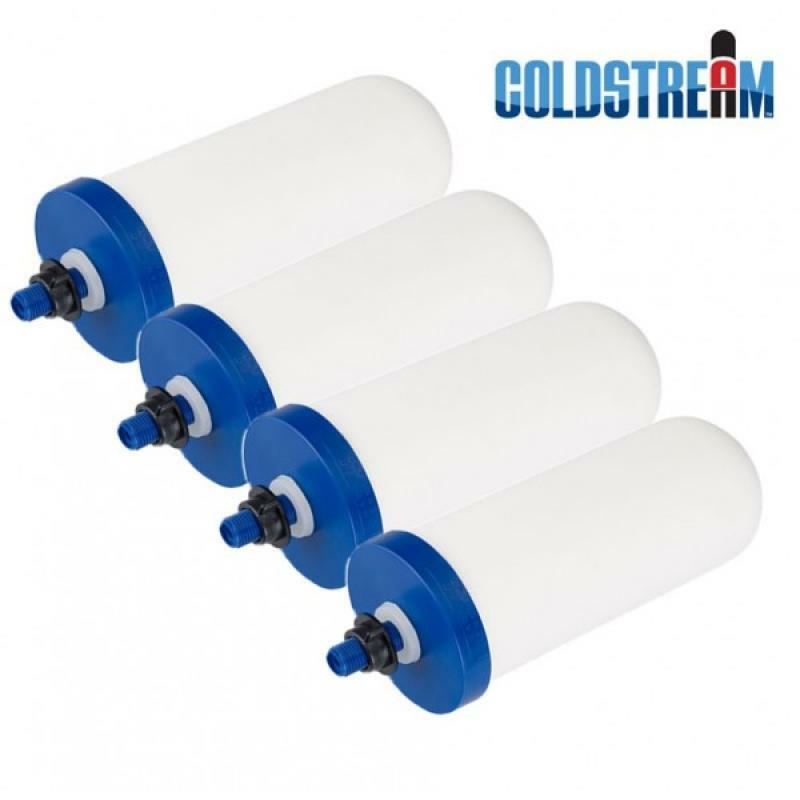 2) Powerful Filters - The Coldstream filters are extremely powerful at filtering. They are even able to reduce fluoride (up to 97% - see test results). 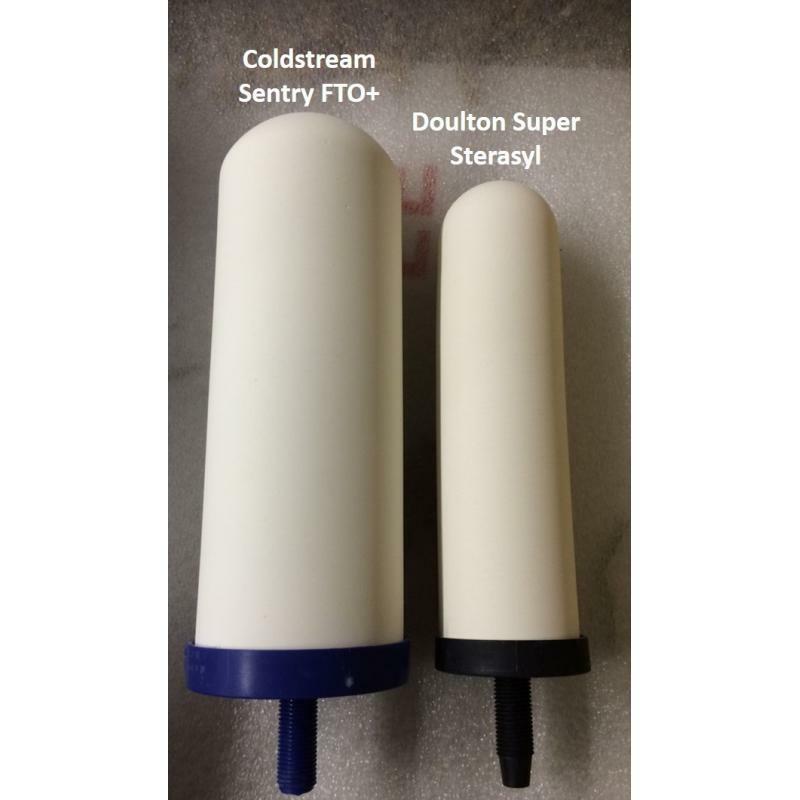 Doulton Super Sterasyl, Doulton ATC Super Sterasyl and Black Berkey Filters do not reduce fluoride on their own, so you have to add extra filters (the PF4's for the Doultons and the PF-2's for the Black Berkey Filters). This is a problem because they screw onto the end of the main filters and take up space in the filtered water chamber. 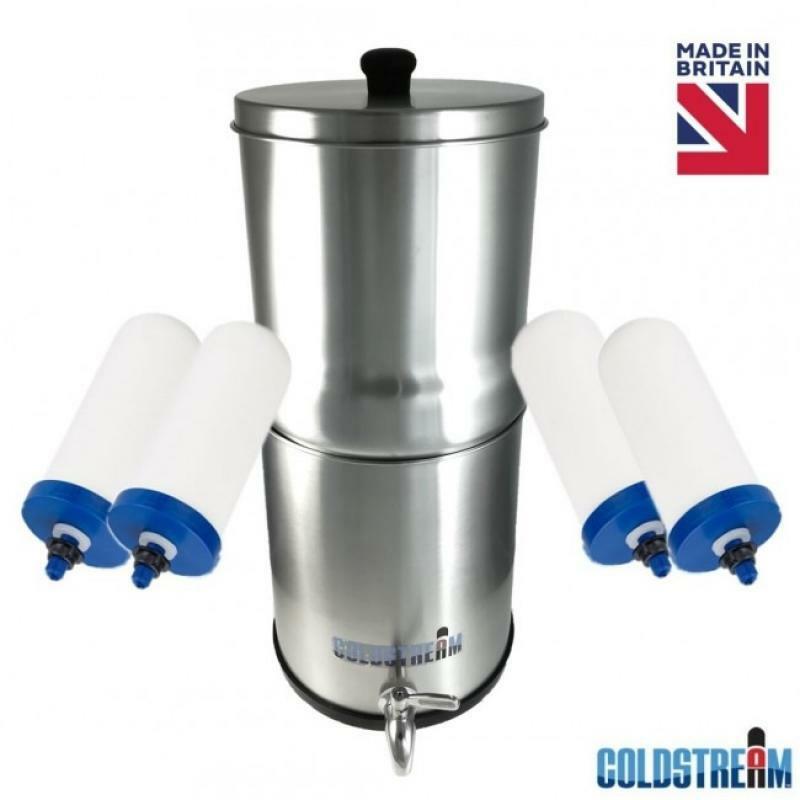 They are also made of plastic so the plastic is then sitting in your filtered water, not nearly as good as Coldstream who have solved it through their more advanced filtering technology. 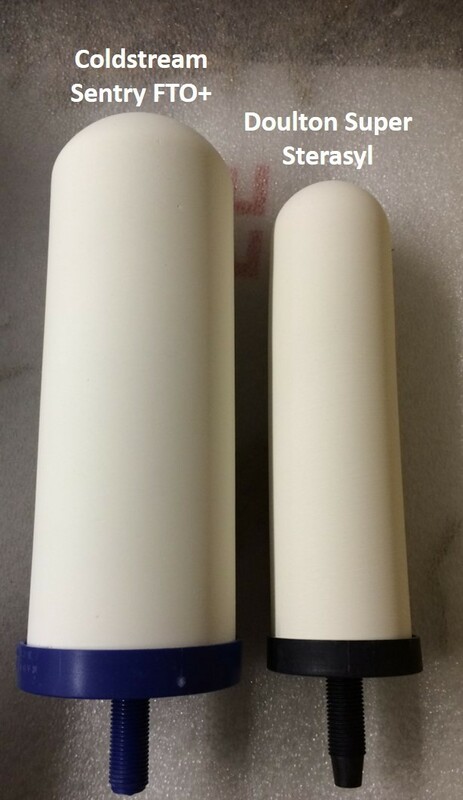 3) Fluoride Removal - the other very important aspect of the Coldstream filters is that they reduce fluoride without using Activated Alumina which exchanges fluorides with aluminium hydroxide. Coldstream use micro-ceramics to achieve this without migrating materials into the water through exchange making them far superior to older fluoride reduction technology. 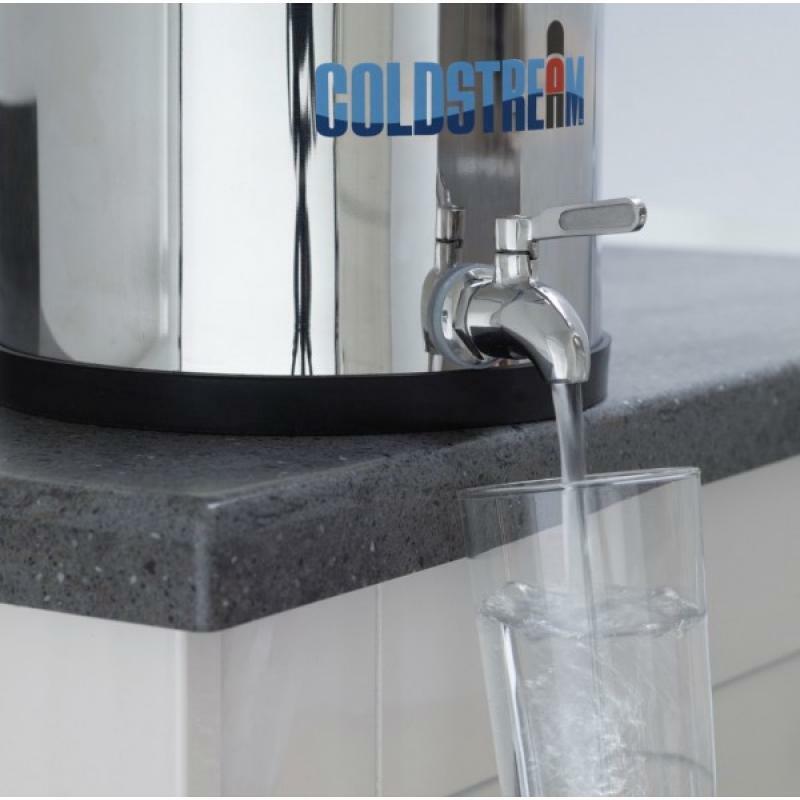 3) Stainless Steel Tap - The Doulton (British Berkefeld) and Big Berkey all have a plastic tap which is nowhere near as strong and durable as the stainless steel tap which comes as standard with the Coldstream system. This tap will provide years of trouble free service and is sturdy and reliable. Dimensions: Assembled 8" x 19" / Stored 8" x 13.5"
Big Berkey (8.5 L) Portable Gravity Water Filter System UK Two Black Filter..
Go Berkey (0.95 L) Portable Gravity Water Filter System Top Qualit..
4 Pack of Coldstream Sentry FTO+ 2.9" x 8" Ceramic Gravity Water Filter Th..
Travel Berkey (5.7 L) Portable Gravity Water Filter System✓ Supplied complete with two ..